Color: Black and tan, red and sesame, with specific white or cream patterns. Coat: Double coat with thick, dense short undercoat and straight hard outer coat. 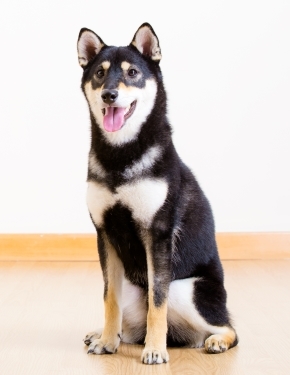 Is a Shiba Inu the Right Dog Breed for You? The Shiba Inu has historically been used for hunting, but today is mostly a house pet or show dog. They are loyal, excellent watch dogs and can be good with children if raised with them. They can tolerate both heat and cold temperatures. Their personalities can border on dominant and can be aloof with strangers. They are particularly adept at escaping enclosures. They can be vocal and will readily bark. They can be resistant to leash training, or any type of restraint. Early socialization and obedience is crucial. They are moderate shedders and have low grooming needs.